When love is in the air, Paris is the place to be and you can now capture the ambiance of the City of Love at your special event. A stunning black candle glimmering with a live flame is certain to create the romantic ambiance you want on your guest's tables. Added to this, a magnificent iconic Eiffel Tower sparkling in silver will add that extra classy touch. Our votive is crafted in a gorgeous dark black glass. 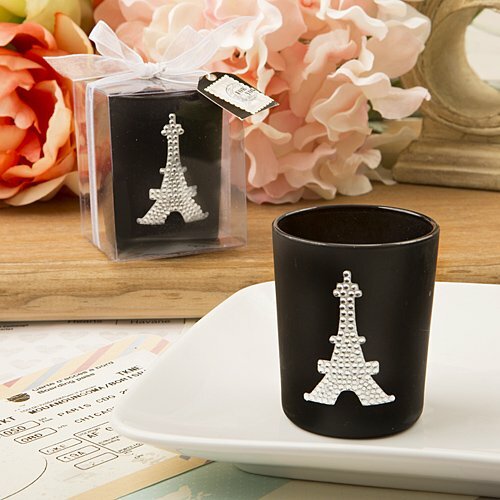 Adorning the front is an elegant Eiffel Tower embellished in clear rhinestones. The votive comes with a white tea light candle. Your event tables will look glorious when the candles are lit and the Tower sparkles with light and love. Packaged in a beautiful gift box, this is the perfect favor for romantic occasions, weddings, bridal showers and others special events where love is in the air.